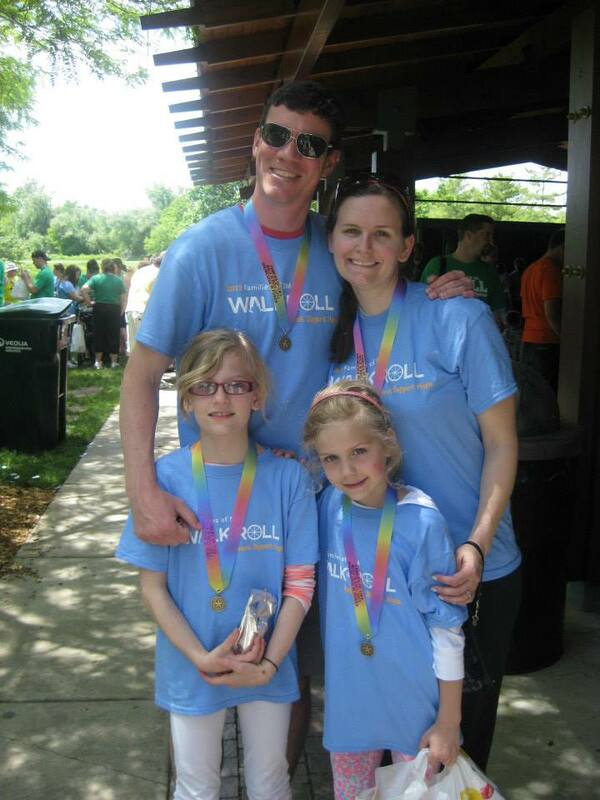 IL Families of SMA Walk & Roll approaching… on June 22nd – JOIN or HELP NOW, please! 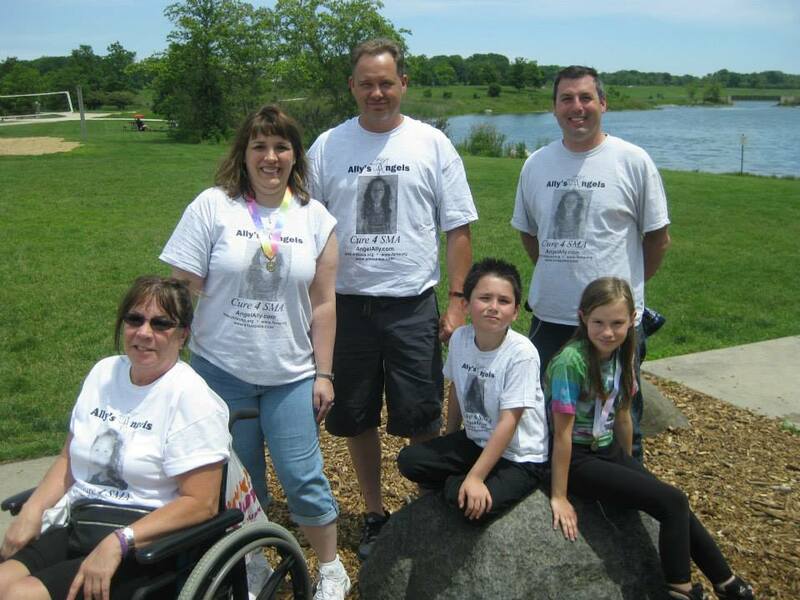 Have FUN while helping Ally and others with Spinal Muscular Atrophy!!! Who wants to join us for a Walk and Roll? This one is for Families of SMA and will be held on Sunday, June 22nd at Independence Grove in Libertyville (the day after my mom’s wedding party) starting at 8:30/10-1:00. The Ally’s Angels team has gotten VERY small and we hope some family and friends will join us for FUN and time together. If unable, please consider making a donation at http://www.fsma.org/LWC/ally2014. We are also looking for donations for our raffle. These can be items, tickets to events, gift cards… and any company or sponsor who donates $250 in items or a monetary donation can be featured on our official IL Walk N Roll Tshirt. This must be done by June 1st to be included. Just wanted to quickly let everyone know that Ally will be coming home on Friday (most likely earlier afternoon). Her port removal was not able to be done in interventional radiology and has to be done by a surgeon since it was placed by one. No surgeons are available today or tomorrow since its not emergent. Ally will go home on iv antibiotics till next weekend and plan surgery in the near future which might be able to be done outpatient. I am semi-stressed about all this, but have to move on and focus on Kristyn graduating next weekend, getting a used car from Ally’s teacher this weekend for Kristyn to use this summer and when home from college, Melissa’s talent show, and Ally maybe even doing a wheelchair race in the special olympics at school at the end of next week. Crazy life we live, but have faith in God’s plan and knowing everything will eventually work out the way it’s meant to be. Thank you again for everyone’s support and prayers. We took Ally down for surgery to remove her port around 4pm (and majorly changed Ally’s nutrition in preparation for surgery), but due to lack of efficient communication it could not be done today in Interventional Radiology as planned. Since the port was placed by a surgeon and is overall deeper, it needs to be removed by a surgeon in an surgery room. It was then too late to do today, but we are trying to plan it for tomorrow. However we don’t have a time yet and have to try to replan nutrition changes for surgery. VERY stressful for myself and Ally who had some anxiety. She is now resting in her bed. Hopefully somehow we can still go home Sunday. Met with Infectious Disease doc and we decided to do surgery to remove Ally’s port THIS hospital stay, most likely on Wednesday (tomorrow). She will then have a temporary line placed to receive about 3 more days of IV antibiotics IN the hospital. I feel very good about this plan since she has grown the same bacteria 3 times, it most likely lingered a tiny bit on the port (bacteria likes a foreign body) and then spread when she had her bone infusion and maybe a little during monthly flushes. It most likely even caused that fever spike during the infusion. She can benefit from a port for easy access for blood draws, infusions for her bones every 4-6 months… BUT the risks now outweigh the benefit. I am happy it will be removed and resolved before going home. Overall, I don’t think we will plan another port for Ally. We will just need to do ultrasound guided IVs, PICC lines, and/or find the best staff to access her veins when needed. Plan will be to go home about Saturday. I am VERY grateful the hospital staff is working on consistency of care and have given EXCELLENT care. We will be home in time for Kristyn’s graduation and Melissa’s talent show. Thank you again for continued prayers and support. Healthy visitors are appreciated. 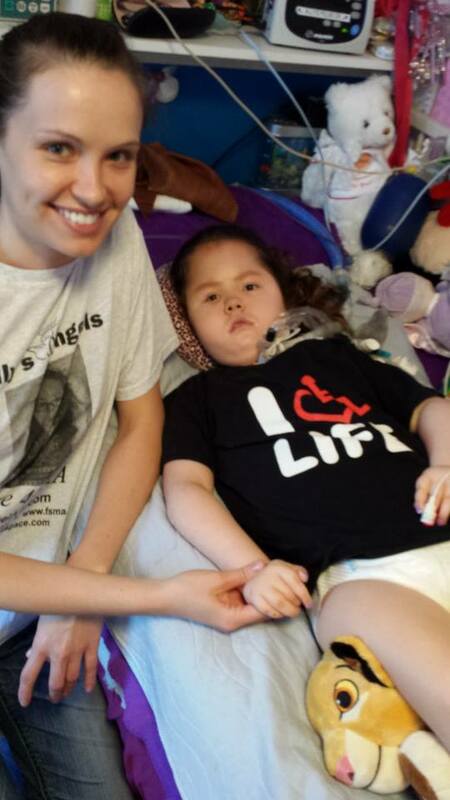 As many may know from facebook or otherwise, Ally was admitted to Lutheran General Hospital on Friday 5/23/14 for another blood infection in her port. She spiked a fever on Thursday during a pamidronate infusion (unrelated to the infusion) so we did labs and found out Friday she had a blood infection and needed to be admitted (plus she vomitted several times and possibly developed a slight aspiration pneumonia). Since Friday, we have been treating Ally with IV antibiotics and increased respiratory treatments. Lutheran General’s medical team has been EXCELLENT with Ally and our family, plus it is less stressful than the hustle and bustle of downtown Chicago (traffic and parking, meals, smaller staff…). This, overall IS our new, main hospital! Now, Ally’s blood culture have come back negative for 2.5 days and after checking levels of antibiotics, we were able to switch her to a “milder” IV antibiotic 3x a day. There is a chance we could go home today (and continue IV antibiotics there), but I am overall going to ask to stay till Wednesday for one more day of help with her increased breathing treatments (and some changes in her medicated nebs). We went from breathing treatments 2-3 times a day at home to 4x, then 6 times a day here (including 2 in the middle of the night) due to 3x the amount of thicker secretions (but no oxygen or higher vent settings). Breathing/secretions are improving, but I don’t want to get behind if we went home too soon. I will update more after meeting with the medical team today (which will be different after the holiday weekend ending), but most likely we will go home on Wednesday, or latest Thursday. We will decide in the near future about keeping or removing the port, but need it now for access to deliver the antibiotics (in hospital and for about 10 days at home). I’m glad Ally beat this quickly since Kristyn graduates high school next week and I want to be there as a family. Melissa will also be dancing in her school talent show next week. Thanks again for the prayers and support! TWO New Ways to HELP…. have FUN… and maybe even WIN A TRIP!!! 1) Who would like the chance to WIN a vacation or $500 cash? Ally’s school,New Horizon Center is doing their biggest fundraiser of the year, the 15th Annual Festival of Chefs on May 19th and selling dinner tickets and raffle tickets. Please let me know if you would like to attend or buy a raffle ticket in honor of Ally and to have the chance to WIN BIG. Tickets are $20 each or 6 for $100. You can paypal me at tina@angelally.com or if making a big purchase do a donation on the school website and mark it is for raffle tickets (plus let me know). 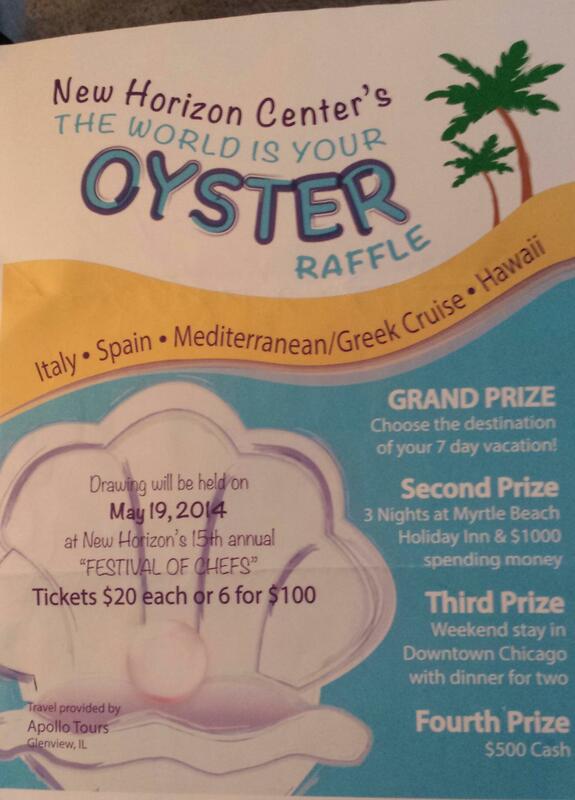 See picture of the flyer above or go tohttp://www.newhorizoncenter.org/#!festival-of-chefs. Thanks in advance to those interesting in helping and Good Luck!!! 2) Another way to have FUN while helping Ally and others with Spinal Muscular Atrophy!!! Who wants to join us for a Walk and Roll? This one is for Families of SMA and will be held on Sunday, June 22nd at Independence Grove in Libertyville (the day after my mom’s wedding party) starting at 8:30/10-1:00. The Ally’s Angels team has gotten VERY small and we hope some family and friends will join us for FUN and time together. If unable, please consider making a donation at http://www.fsma.org/LWC/ally2014. We are also looking for donations for our raffle. These can be items, tickets to events, gift cards… and any company or sponsor who donates $250 in items or a monetary donation can be featured on our official IL Walk N Roll Tshirt. This must be done by early/mid May to be included. Just wanted to share an interesting update on Ally’s spine surgery quest — We saw her regular neurologist and pulmonologist yesterday at Lurie Childrens so that they can give an accurate update on how Ally is doing. They were both supportive of Ally being stable and needing surgery so that things do not become more complicated. The neuro said we need to take the approach to help other doctors learn that SMA IS VERY serious, that Ally herself is severe and anything can happen any day, but overall SMA plateaus in symptoms and kids are living longer with proactive care (which is more and more including spine surgery to avoid pain and even more complications with breathing). We also agreed to do another pamidronate bone infusion in the next few weeks while figuring out what will happen with Ally’s spine. THEN, this morning, I got a call from Dr. Sturm’s office in CINCINNATI. I had Ally’s spine records sent there and he and his colleagues look at them and he said HE CAN DO SURGERY on Ally. Now we would just need to get IL medicaid to approve it, but the process is started! 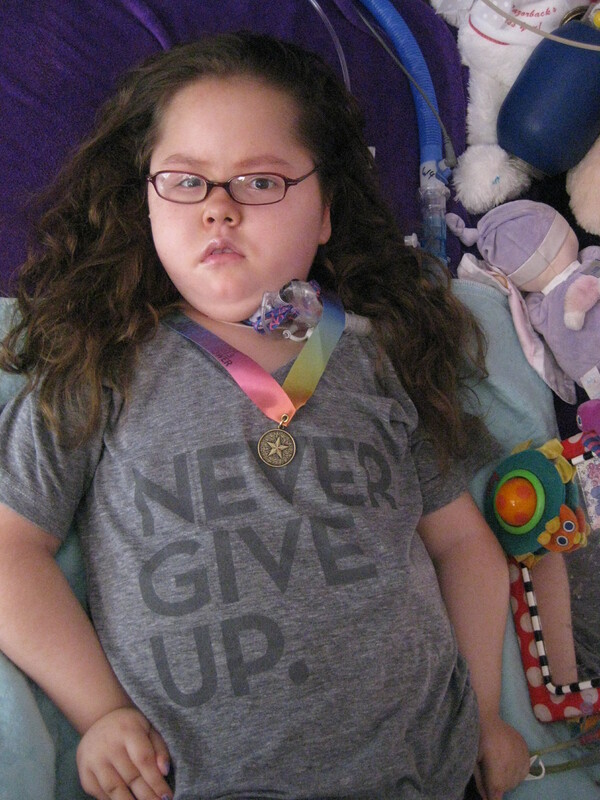 I haven’t completely ruled out the surgeon in IL, but if we can get this covered in Cincinnati, where they have done surgery on about a dozen SMA kids and have GREAT care at their hospital, we will go there. There is lots of paperwork and requesting of more records, but I am hopeful! If approved, we would most likely do consultation and pre-surgery stuff in one visit and then would come back another time for surgery. Not sure which type of spine surgery they are most considering, but excited about their experience.